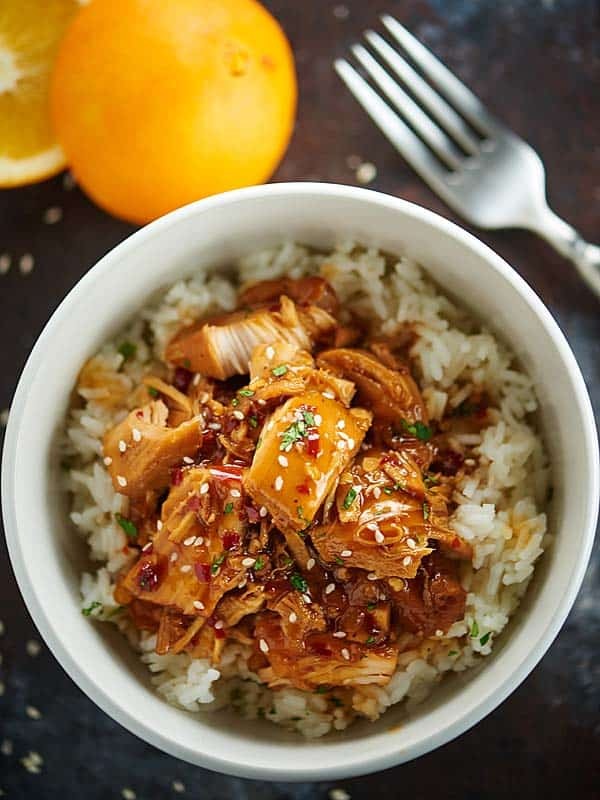 This Crockpot Orange Chicken is better than take out! 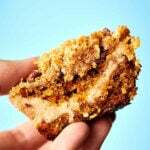 It tastes better, is so much healthier, and is ridiculously easy to make. Orange chicken for the win! 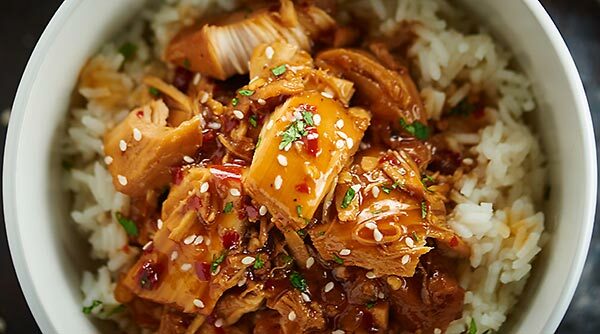 This Crockpot Orange Chicken is one of our most popular recipes (originally posted November 20, 2015), so I’ve updated it to include a how-to video! Enjoy! 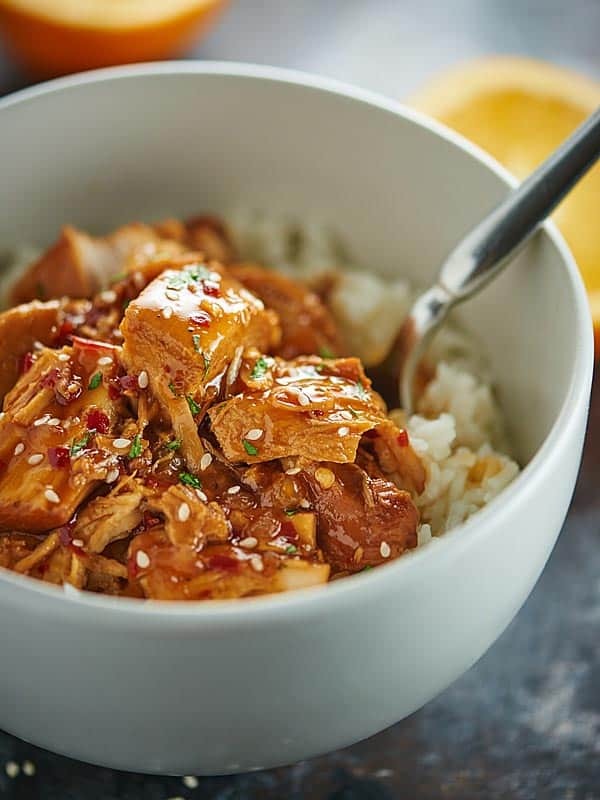 Crockpot asian inspired recipes like this crockpot orange chicken are the best! You can also check out: slow cooker lo mein, slow cooker teriyaki chicken, slow cooker kung pao chicken, slow cooker ramen noodles. As with most of my recipes, this one started out with craving. A craving, for orange chicken. Orange-y, spicy chicken with a steaming side of perfectly cooked white rice? Swoon. As much as I wanted to just order take-out, with Thanksgiving coming up, I figured I should probably skip the take-out, and try to recreate something healthier at home. Thank you, Crockpot Orange Chicken, for curbing my craving without the guilt. But for whatever reason, I was the one craving orange chicken the other day, and I knew Trevor would totally be on board. When I get a craving for something, I get kiiiind of o.b.s.e.s.s.e.d, so if I’m going to make it at home, it’s gotta be easy. Luckily, this chicken only needs 5 hours to cook (vs 8 hours in some crockpot chicken recipes) and it literally look me less than 5 minutes to whip up. 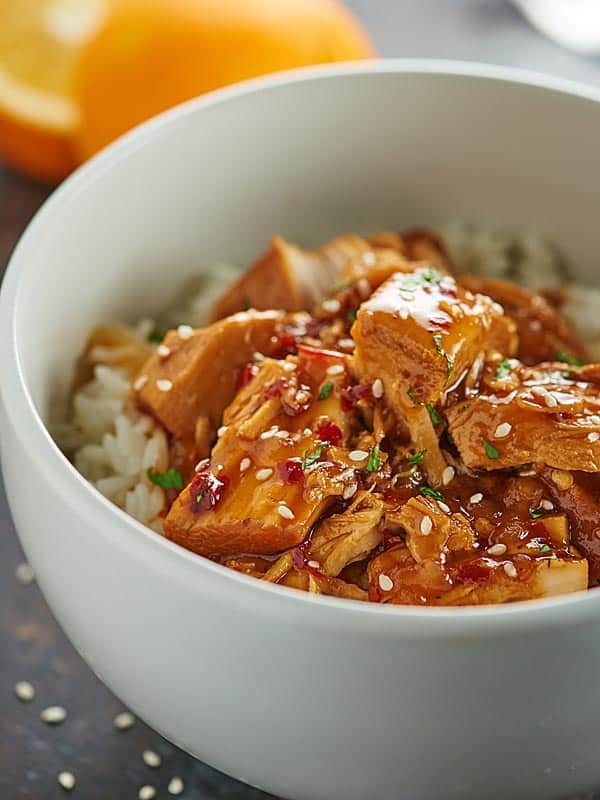 How do you make healthy homemade orange chicken? Grease your crockpot. <– as usual, I’m obsessed. Throw sauce and chicken into crockpot and cook on LOW for 4 hours. Stir in cornstarch and let it cook for another hour on HIGH. Serve with rice and stuff.your.face. 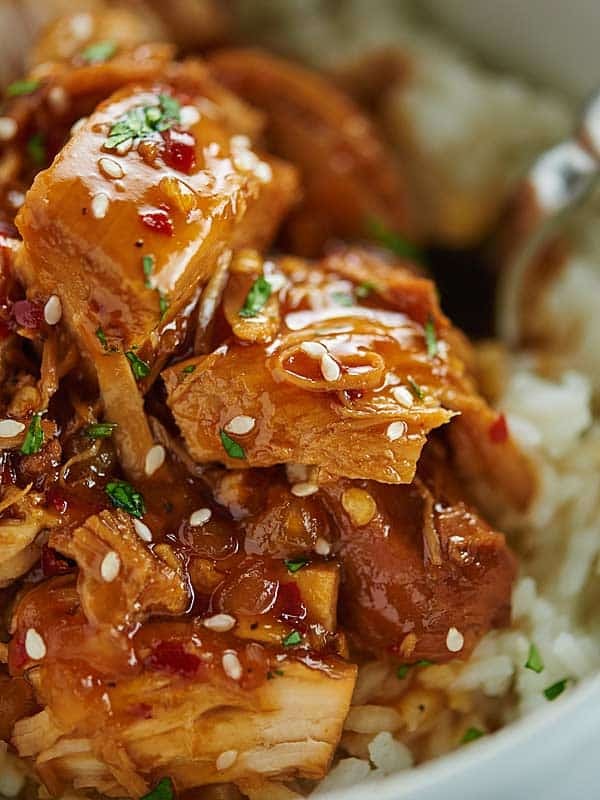 This crockpot orange chicken is c.r.a.z.y. good, you guys. The sauce is perfectly orange-y and you can make it as spicy as you like! Now. Here’s the deal. When I first had Trevor taste-test, his immediate reaction was YUM. Buuuuut, he wanted the sauce to be thicker. Trevor was expecting that really thick, sticky, sauce that coats breaded chicken. Well. This isn’t the recipe for that. 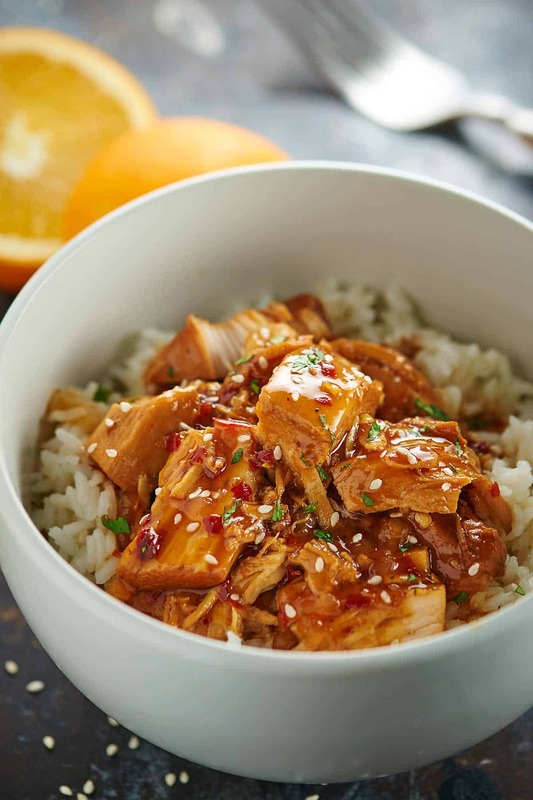 THIS crockpot orange chicken has those same amazing orange chicken flavors you love, but without all the guilt! Plus, it’s super saucy and when you serve it over rice, the rice soaks up all those crazy flavors. And basically, it’s just amazing. Later that night, I served this crockpot orange chicken up with some steamed rice and Trevor did a complete 180. What are some of your favorite take-out/delivery foods? I’d love to recreate them! Show me the yummy! Whisk together sauce ingredients: broth, orange juice, brown sugar, honey, vinegar, soy sauce, garlic, orange zest, red pepper flakes, ground ginger, and black pepper. *Gluten free? Be sure to use a GF soy sauce or a GF alternative! This looks so good! 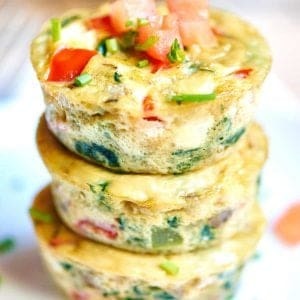 I wanted a dish to take to pot-luck at church, and vegetarian.I am going to try to make this using some re-hydrated soy pieces, it’s made me a little excited to cook again! The water is already in the kettle heating up to use on the soy. Thanks Shirley!! I’m so glad you’re excited to cook again. 🙂 I’d love to hear how the soy turns out! I made this tonight on the stovetop because I ran out of time to prep it this morning, but either way it gets rave reviews from my husband and I! I know we will be coming back to make it again soon! With 2 members of the family who have celiac disease, our days of eating at Panda Express are over. I made your version in the crockpot today – making sure each ingredient is gluten-free (even the spices) which was actually easy to do. It was a huge hit!! Thank you so much for sharing! I’ll be making this tomorrow for our friends and it will be the first recipe ever in our first slow cooker ever. Really looking forward to using the slow cooker and hope the result will be as good as expected. 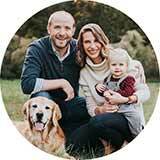 Your description is great and it looks super easy, were excited! How many chicken breasts do you use? I bought frozen ones so I don’t know how many 2 lbs is haha. Hi there! Chicken breasts can vary greatly in size, but the average chicken breast is around 5-8 oz. I’d say go with 4-5 chicken breasts. 🙂 Also, for accuracy I always weigh my chicken with this kitchen scale. I hope that helps!! Get a digital kitchen scale. They are inexpensive and come in handy. I’m not a great cook so I read directions all of the time! I just want to make sure- I put the sauce mixed with the cornstarch back into the crock pot with the cut up pieces of chicken, right? And, I’m not big on white rice. Is there any other kind you could recommend that might pair nicely with this recipe? Hi Barb! Once the chicken is cooked, remove the chicken and set aside. Whisk the cornstarch directly into the sauce (that is still in the crockpot). Cut up the chicken and stir that back into the sauce/crockpot. I hope that helps! Brown rice would be wonderful with this! There’s a similar recipe using beef where you add snow peas during last 30 minutes of cooking. You could also add fresh, raw broccoli. I will be making this chicken recipe soon! You could also do quinoa, which cooks beautifully in a rice cooker, or farro. Absolutely! You use really use anything! This recipe was so easy and delicious!!! I was looking for a good, easy orange chicken recipe … this was it! I only had 1 pound of chicken which I cut in large chunks prior to cooking (saves a step later on) but I made the full amount of sauce (yummy on white rice); I also held out about 1/2 cup of sauce to blend with the cornstarch (mixes better). I used 2 tsp of red pepper flakes … we like spicy but this was a bit too much so I will drop it back to the 1 tsp and adjust from there. Hi there! So glad you liked this! 🙂 Thanks! GramCracker–love the tip about holding out a small portion of the sauce to mix with the cornstarch later on. I’m a disaster with getting it to blend. Thanks! Making this today. This looks sooo good. Here it is, 12 am on a Friday night, and I’m making this. Can you say hungry? I cannot wait to try this. I didn’t have chicken breasts, so I used thighs instead. Thanks for the recipe! I’m going to make this with chicken legs. Do you think the bones will change the cooking time at all? Would regular orange juice work? If so should I reduce the amount of sweetener? Has anyone tried it? Thank you!! I can’t wait to try it! 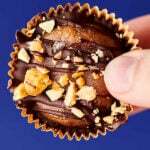 DO you know the nutritional information? I am making this tomorrow. Thank you! I made this for supper tonite. It was really good. I served it with brown rice. Was a lite saltier than we are used to so next time I may cut back on the soy sauce. I love how the cornstarch thickens it up- so sticky and yummy! It froze perfectly! Sauce was delicious!!! Does this freeze well to serve at a later time? Can I also do this in the 8 hour version? I leave in the morning at 7 am and get home at 7 pm and would love for dinner to be ready! My husband was craving orange chicken and after seeing all of the sodium and preservatives in the frozen brands I decided I would make a homemade version. This was the first recipe that popped up so I figured I would give it a try. Based on some of the other reviews I cut down on the soy sauce by 1/8 of a cup and used 1 teaspoon of the crushed red pepper flake and it was amazing! I’m not a huge fan of orange chicken but this was sooo tasty! I served this with sautéed veggies and rice and it was absolutely delicious! Absolutely delicious! I might take down the red pepper flakes to even less than a teaspoon just because I’m a wuss, but the chicken and sauce were wonderful! This is my first time trying this recipe..it looks super delicious. Does the chicken need to be thawed out or can I put the chicken in frozen (I assume it would just take longer to cook)? The sauce didn’t turn out very thick. Is that normal? If not, how can I remedy it? If I wanted to double or triple the recipe, can I throw it all in one big crock and just increase the cook time? Or should I use multiple pots? What exactly is orange zest ? What size of crock pot do you use? This recipe is good, however I sautéed some coloured peppers, onions and mushrooms to add to the finished product just to give it some extra oomph. Would make again with my additions. Do you think the sauce thickening step at the end could be eliminated by starting out with flour coated chicken chunks at the beginning? Trying to make this super easy for my husband. I bet that would work, but I haven’t tried it, so I can’t guarantee the results. 🙂 I would also recommend making the recipe as is for best results. This was delicious! The only change I made due to time was cooking for two hours on high before I added the cornstarch and the chicken was still tender and juicy! Oh, I used a tsp of red pepper instead of flakes because I didn’t have time to run back to the store. So two small changes, oops. This is definitely going in the crock pot rotation – thanks for sharing. Could quinoa be used in place of the rice. I have quinoa but have never cooked it before. . Sounds really good. I like the addition of colored peppers and onion as one person suggested. Absolutely! 🙂 Just follow the directions on the package of the quinoa! Would it work to use cooked chicken and then just mix in the sauce and the rice? Or to cook the rice in with the chicken at the same time? I have pre-cooked chicken and I would like to keep it in one dish. You could definitely give that a try… I’ve never tried it, so I can’t guarantee the results! I made it with cooked chicken and it turned out great! I made the rice and the sauce separately and then just mixed it all together and let it thicken in the crock pot for about 15 minutes. It was so good and easy! Definitely going to make it again! If I cut the chicken in chunks before cooked would it shred when done? First of all I need to say I’ve used so many of your recipes with fantastic results! Thank you and keep ’em coming! I used to be a huge fan of the Crock-Pot until I discovered the instant pot… Any chance you’ll be making recipes with both the crock pot cooking times AND the instant pot instructions? 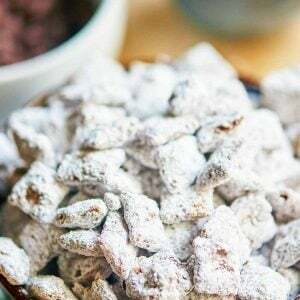 I’m going to try to make this in my instant pot tonight because I. Just. Have. To. Yum! 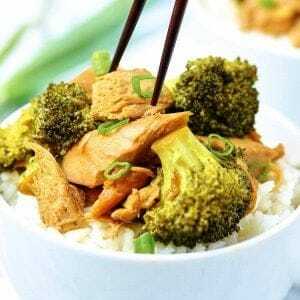 Tastes better, healthier and easier to make than take out orange chicken? I’m sold! It looks amazing! That sauce! I can see why it’s one of your favorite recipes on the blog! anything in a crock pot is my friend. LOL! winner of a chicken dinner.